I am told that when you are in Africa, in places like rural Azawak, time changes. What happens in our safe lives in the span of two hours is like a ride down a lazy river, compared to what happens to people who live each day making extreme efforts just to get their basic needs met. 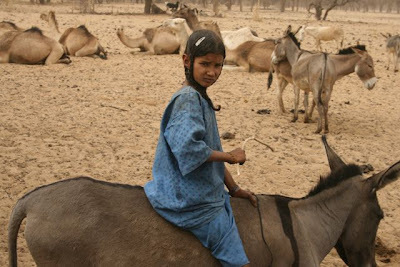 On top of searching for water and getting enough food, the perils of walking long hours in surging temperatures through terrain without trails to get to a school, or riding on the back of a donkey for two days while sick in order to reach a health center, is unimaginable. We who simply hop into cars on a whim to buy groceries, go to the movies, or sightsee in the countryside cannot possibly fathom life in a place like the Azawak. How can we convey these real-life challenges to young students without traumatizing them with harsh realities? What can we do to widen their vision beyond their comfort zone, but still protect their innocence? How can we present life in an environment completely unlike their own in a way that inspires within them a sense of compassion and possibility rather than despair, guilt and gloom? There are some things you simply can’t explain to a three year old, and some things you would not want them to see. But even three year olds can understand a smile. Even three year olds can understand the difference between muddy water and clean water. They know the bond of a mother and a child. There are some things that cross boundaries of place and circumstance. Stories reach even the youngest among us. 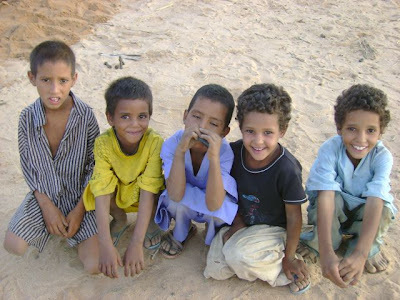 The tribulations of the people in the Azawak, due first and foremost to their lack of water, combined with the beautiful photos that convey their humanity, beauty and love, allow students of all ages to identify. Engaging students in the Amman Imman project gets them involved across the boundaries of schools, communities and countries to make a difference in the lives of people that no one else is helping. A global problem is identified, explained through stories and photos, and a solution is presented. What the people of the Azawak need most is water – before they can have schools, before they can have health centers, water must provide life and be the spring from which all the other improvements will come from. A window opens. 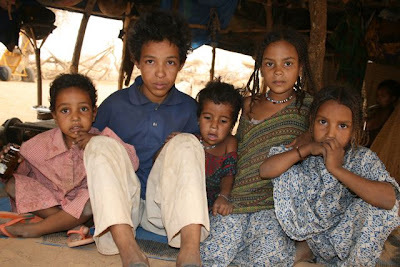 Children identify with the humanity of the people of the Azawak who live in loving families, get hungry and thirsty just like them. Although our children cannot experience what it is like for the children of the Azawak to travel 30 miles for a little bit of water, through stories and pictures that convey their spirit, they can begin to empathize. Compassion crosses the borders of place and time, widens vision and opens up the possibility for real change. To see the people of Tangarwashane turning on a faucet from the Amman Imman tap when previously they were scooping mud from the marsh before it dried, conveys a real possibility of changing lives and gives our children a sense that their efforts, however small and far away, reaches across boundaries and means something.